I recently got some Tour Ultras to replace my SST8's. I'd had some back when they were ABS and loved them. Unfortunately, when a took a hiatus, I left them in the garage and they got ruined. Anyway, I just got them back from Gary Faulkner (who did an excellent job on them) and they Will. Not. Slide. I've tried every sole/heel combo. Nothing. I never remember the ABS's having any problem. Anybody got any hacks to slicken them up? I really don't want to order a bunch of Dexter soles and cut them to fit, but I will if I have to. My wife has them too, got her a slide sock for the real humid days here in Tampa. Winter league the approach is less of an issue. Slide sock is the absolute last resort. I too had the Tour Ultras from the ABS days. If the sole components are the same or similar to the ABS version then you may need to break them in more than say a Dexter or other current brand. Specifically was the heal on mine. I had to have an amount of accumulated "stuff" on the heal to have any slide. If I scuffed the heal on carpet I would remove some of the "stuff" and I would stick. All of the sole pieces took a long time to break in. Just spend the time to break in each one and you will have a good set of soles that will last a long time. I was hoping there was a quicker fix. I guess I'll work on them and just be glad my SST8's are holding together. I own 1.5 pairs of Tour Ultras. The ".5" is the slide shoe from my first pair that I have set-up for a wood approach. I largely bowl on synthetic approaches and use the #10 sole (felt). These I buy from an on-line company somewhere between $7-$9 each. But I further alter the surface using a leather hole punch to place a series of holes around the perimeter of the sole. (On the wood approach shoe I use a piece of deer skin, again using the punch to alter the surface, perimeter but also a diamond pattern in the center of the sole.) It was bit of trial and error but once done you should be set. For the heel: The wood approach shoe I use a red leather heel. For synthetic approaches, I use a heel of my own design. The back two thirds is the "chrome" leather from the 3G sole. (Having gone through my "Chrome leather" soles I now use a similar hard leather bought from a hobby store.) The front third is a piece of microfiber sole material. I made the heel from a 3G smooth white rubber heel. I filed down the surface just enough to allow for the thickness of a piece of Velcro, and then glue the Velcro to the heel using a 3M spray adhesive (whatever their strongest formula is). The aforementioned section then attach to the Velco. Again, a bit of work, but once done, it's done. In addition to a brass wire brush I will use a medium grade sanding block to clean the surfaces, heel and sole. I actually use the sanding block more than the brush. The sanding block is a foam 3M product that I buy at Lowe's or Home Depot. This is my solution to the slide problem. Hope it helps. I contacted 3G and they seemed surprised. Suggested I try a felt sole. I also talked to some friends who gave up and cut up Dexter soles. Back in the days when Linds was the best shoe out there, I would spray the sole with silicone spray then rough it up as needed and that worked like a charm. I'm going to try that on the deerskin and cross my fingers. I appreciate the feedback and will let you know how things work out. If anything else, they look awesome, thanks to Gary Faulkner. Gave up and ordered S8, S10, and S12 Dexter soles and cut to fit. I prefer the whole sole over the holed back skin sole with pucks as I go from wood to synthetic weekly. The whole sole is easier to change and does not have the puck compression issue. 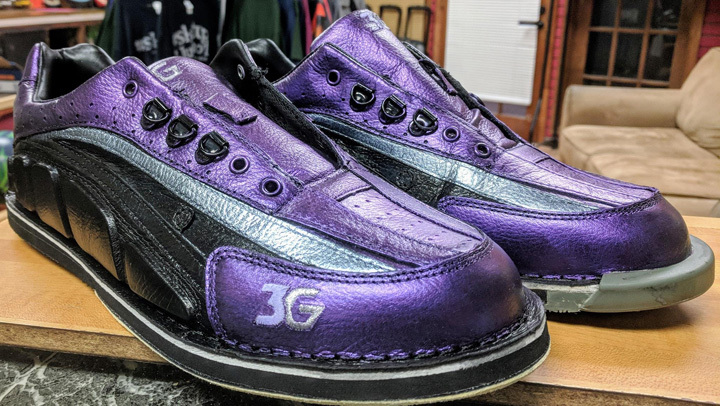 The black felt sole from 3G is not as slippery as a Dexter S12. The black felt 3G might be about the same as a Dexter S10. Like you Mongo, I purchased Dexter S8, S10 and S12 and cut them to fit them seem superior and don't get as shiny as the 3G black felt wears over time. I do like the sole/heel profile of the 3G's vs. a Dexter. I am a whole foot slider and the slightly lower heel to the sole of the 3G TU I prefer. It's something I have gotten use to over the years more like a Linds Classic sole to heel profile. This is exactly what I do bc I prefer the fit/feel of 3G but the slide characteristics of dexter. I bought this heel on my original pair of the Dynarooz and still use it on my current pair of the 3G Tour Ultras, it comes with a #6, #8, and a #10 felt strip. I also use only the #6 sole that has the holes in it for the dots to be used in. Some houses I only use the #6 dots, others I do have to put some of the teflon dots in to get a better slide. I'm very much a slider, planting or sticking destroys my knee.